This pumpkin soup is simply delicious and easy to make! 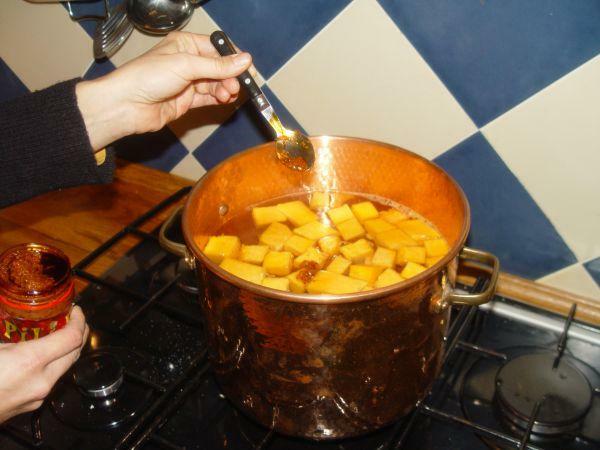 Bring the vegetable broth in the copper pot to a boil, cut the pumpkin into little pieces, remove the pulp and peel and add the pumpkin pieces to the broth. Depending on the pumpkin you chose, you can either remove the peel beforehand or cook the pieces with it. 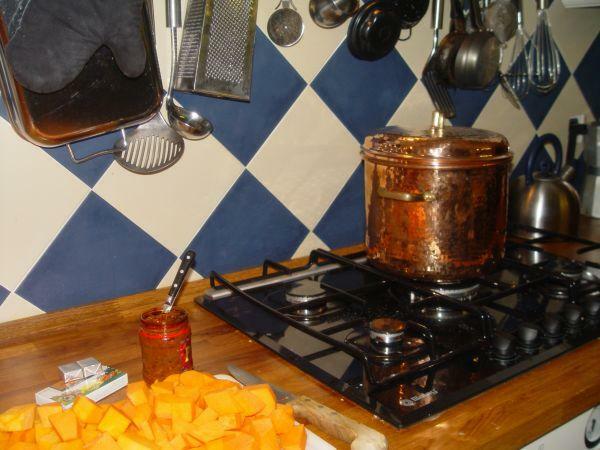 Let it all cook until the pumpkin pieces are soft which ususally happens quite fast. The more pumpkin pieces you add to the broth, the thicker and creamier the soup will become. Or use less vegetable broth in order to receive the same effects. The soup tastes best with a thicker, creamy consistency. Now you can add one teaspoon of Harissa and stir everything thoroughly. Feel free to add more spices or herbs to the soup. Fill the soup into little bowls with a tablespoon of cream, gently stir it in and enjoy! If you have a little bit more time at hand, you can also serve fresh bread which is also a nice addition to this meal and will round everything up. You can do it yourself by mixing 500 g of flour with a package of yeast (usually 40g), a bit of salt, olive oil and lukewarm water to create a soft dough . If you like you can add some spices and then let everything rest for 30 min until the dough has doubled in size. Form the dough into little pita breads and preheat the oven at around 200°C, circulating heat. Bake for 20 to 30 min. Have fun experimenting with the ingredients & spices!